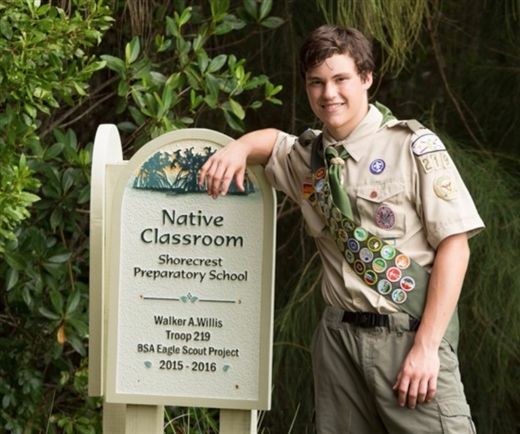 Shorecrest junior Walker Willis has earned the prestigious Boy Scouts of America William T. Hornaday Silver Medal for his restoration and conservation project "The Native Classroom." The national award, known within Scouting as "an Olympic Medal Bestowed by the Earth," is a century-old honor. Walker was recognized on November 2 at the 20th Annual Distinguished Citizen Award Dinner presented by the Boy Scouts of America Greater Tampa Bay Area Council. Walker undertook a restoration and conservation project to improve an important Tampa Bay estuary along the 54th Avenue Channel in St. Petersburg, Florida. The channel is adjacent to the Shorecrest Preparatory School campus. The three-phase project included the eradication of approximately 1,000 Australian Pines, trees and saplings. "Australian pines are an invasive species which poison the soil and prevent all other plant and animal life," says Walker. Phase two involved planting 500 mangroves, cabbage palms, slash pines, and other native species to enrich habitat, insure soil conservation, and improve water quality. In the final phase, Walker improved an existing educational area by building a channel-side observation ground platform and providing a freshwater source for science students and Tampa Bay Watch volunteers. Throughout the course of the project, Walker recruited and led more than 150 volunteers - Troop 219 Scouts, Shorecrest students, and adult volunteers who invested almost 2,000 hours in this natural restoration and conservation project. "I named this area 'The Native Classroom' because of the new channel-side water quality testing platform and research table provides a freshwater source for science students who are Tampa Bay Watch volunteers in the science classes at Shorecrest, as well as English students inspired to write about nature, and all students of native outdoor gardening and conservation," says Walker. Walker earned his Eagle Scout Award for The Native Classroom project. According to Walker, "Scouting has taught me to love the great outdoors, my family and friends taught me the value of working together, the Sustany Foundation and other conservationists taught me the power of generosity, fellow Scouts taught me how friends can wash countless cars cheerfully, and my school taught me the possibilities available to students who get involved." The Hornaday Awards program was created to recognize those who have made significant contributions to conservation. It was begun in 1914 by Dr. William T. Hornaday, director of the New York Zoological Park and founder of the National Zoo in Washington, D.C. Dr. Hornaday was an active and outspoken champion of natural resource conservation and a leader in saving the American bison from extinction. He named the award the Wildlife Protection Medal. Its purpose was to challenge Americans to work constructively for wildlife conservation and habitat protection. After his death in 1937, the award was renamed in Dr. Hornaday's honor and became a Boy Scouts of America award.